Betamethasone Valerate Foam, 0.12% contains betamethasone valerate, USP, a synthetic corticosteroid, for topical dermatologic use. The corticosteroids constitute a class of primarily synthetic steroids used topically as anti-inflammatory agents. Betamethasone Valerate Foam, 0.12% contains 1.2 mg betamethasone valerate USP, per gram in a thermolabile hydroethanolic foam vehicle consisting of cetyl alcohol, citric acid, ethanol (60%), polysorbate 60, potassium citrate, propylene glycol, purified water, and stearyl alcohol pressurized with a hydrocarbon (propane/butane) propellant. The safety and efficacy of Betamethasone Valerate Foam, 0.12% has been demonstrated in a four-week trial. An adequate and well-controlled clinical trial was conducted in 190 patients with moderate to severe scalp psoriasis. Patients were treated twice daily for four weeks with Betamethasone Valerate Foam, 0.12%, Placebo foam, a commercially available betamethasone valerate lotion 0.12% (formerly expressed as 0.1% betamethasone), or Placebo lotion. At four weeks of treatment, study results of 159 patients demonstrated that the efficacy of Betamethasone Valerate Foam, 0.12% in treating scalp psoriasis is superior to that of placebo foam, and is comparable to that of a currently marketed BMV lotion (see Table below). Betamethasone Valerate Foam, 0.12% is a medium potency topical corticosteroid indicated for relief of the inflammatory and pruritic manifestations of corticosteroid-responsive dermatoses of the scalp. 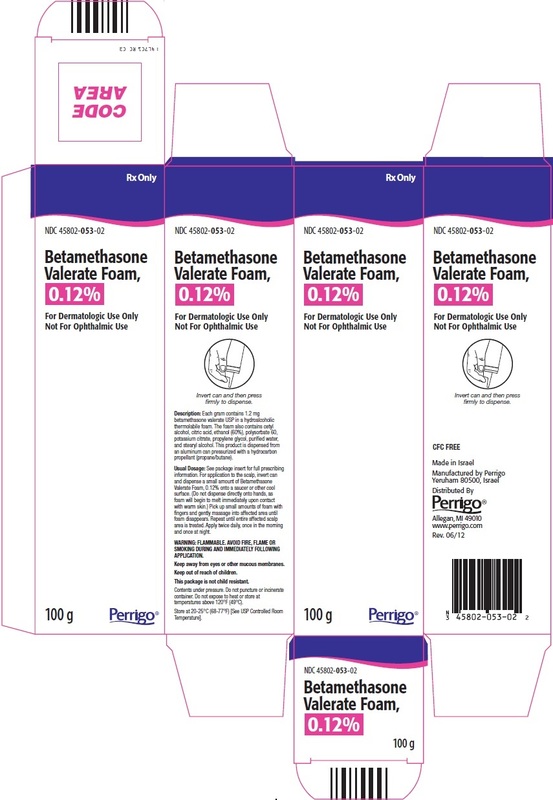 Betamethasone Valerate Foam, 0.12% is contraindicated in patients who are hypersensitive to betamethasone valerate, to other corticosteroids, or to any ingredient in this preparation. Pediatric patients may be more susceptible to systemic toxicity from equivalent doses due to their larger skin surface to body mass ratios (See PRECAUTIONS-Pediatric Use). If irritation develops, Betamethasone Valerate Foam, 0.12% should be discontinued and appropriate therapy instituted. Allergic contact dermatitis with corticosteroids is usually diagnosed by observing a failure to heal rather than noting a clinical exacerbation, as with most topical products not containing corticosteroids. Such an observation should be corroborated with appropriate diagnostic patch testing. In the presence of dermatological infections, the use of an appropriate antifungal or antibacterial agent should be instituted. If a favorable response does not occur promptly, use of Betamethasone Valerate Foam, 0.12% should be discontinued until the infection has been adequately controlled. 2. This medication should not be used for any disorder other than that for which it was prescribed. 3. The treated scalp area should not be bandaged or otherwise covered or wrapped so as to be occlusive unless directed by the physician. 4. Patients should report to their physician any signs of local adverse reactions. 5. As with other corticosteroids, therapy should be discontinued when control is achieved. If no improvement is seen within 2 weeks, contact the physician. Corticosteroids have been shown to be teratogenic in laboratory animals when administered systemically at relatively low dosage levels. Some corticosteroids have been shown to be teratogenic after dermal application in laboratory animals. There are no adequate and well-controlled studies in pregnant women. Therefore, Betamethasone Valerate Foam, 0.12% should be used during pregnancy only if the potential benefit justifies the potential risk to the fetus. Systemically administered corticosteroids appear in human milk and could suppress growth, interfere with endogenous corticosteroid production, or cause other untoward effects. It is not known whether topical administration of corticosteroids could result in sufficient systemic absorption to produce detectable quantities in breast milk. Because many drugs are excreted in human milk, caution should be exercised when Betamethasone Valerate Foam, 0.12% is administered to a nursing woman. Other adverse events which were considered to be possibly, probably, or definitely related to Betamethasone Valerate Foam, 0.12% occurred in one patient each; these were paresthesia, pruritus, acne, alopecia, and conjunctivitis. The following additional local adverse reactions have been reported with topical corticosteroids, and they may occur more frequently with the use of occlusive dressings. These reactions are listed in an approximately decreasing order of occurrence: irritation, dryness, folliculitis, acneiform eruptions hypopigmentation, perioral dermatitis, allergic contact dermatitis, secondary infection, skin atrophy, striae, and miliaria. Topically applied Betamethasone Valerate Foam, 0.12% can be absorbed in sufficient amounts to produce systemic effects (See PRECAUTIONS). For application to the scalp invert can and dispense a small amount of Betamethasone Valerate Foam, 0.12% onto a saucer or other cool surface. Do not dispense directly onto hands as foam will begin to melt immediately upon contact with warm skin. Pick up small amounts of foam with fingers and gently massage into affected area until foam disappears. Repeat until entire affected scalp area is treated. Apply twice daily, once in the morning and once at night. Betamethasone Valerate Foam, 0.12% should not be used with occlusive dressings unless directed by a physician. Store at 20 - 25°C (68 - 77°F) [see USP Controlled Room Temperature]. FLAMMABLE. AVOID FIRE, FLAME OR SMOKING DURING AND IMMEDIATELY FOLLOWING APPLICATION. Contents under pressure. Do not puncture or incinerate container. Do not expose to heat or store at temperatures above 120°F (49°C). Your doctor has prescribed Betamethasone Valerate Foam, 0.12%, for the relief of corticosteroid-responsive skin conditions of the scalp. Betamethasone Valerate Foam, 0.12% works because its active ingredient is betamethasone valerate, 0.12%. Betamethasone belongs to a group of medicines known as topical corticosteroids. These agents are used to reduce the inflammation, redness, swelling, itching, and tenderness associated with dermatologic conditions. Other ingredients in Betamethasone Valerate Foam, 0.12% include cetyl alcohol, citric acid, ethanol (60%), polysorbate 60, potassium citrate, propylene glycol, purified water, and stearyl alcohol. The foam is dispensed from an aluminum can pressurized with a hydrocarbon propellant (propane and butane). • Are you allergic to any of the ingredients contained in Betamethasone Valerate Foam, 0.12%? • Are you pregnant? Planning on becoming pregnant while using Betamethasone Valerate Foam, 0.12%? Or are you breastfeeding? • Do you think you have an infection on your scalp? Before applying Betamethasone Valerate Foam, 0.12% for the first time, break the tiny plastic piece at the base of the can's rim by gently pushing back (away from the piece) on the nozzle. Turn the can upside down and dispense a small amount of Betamethasone Valerate Foam, 0.12% onto a clean saucer or other cool, clean surface. Do not dispense directly onto hands, as foam will begin to melt immediately upon contact with warm skin. Pick up small amounts of foam with fingers and gently massage into affected area until foam disappears. Repeat until entire affected scalp area is treated. Apply twice daily, once in the morning and once at night. Use sparingly—only enough to cover the affected areas. Gently massage the foam in until it is absorbed and allow the areas to dry naturally. When applying to the scalp, move the hair away so that the foam can be applied directly to each affected area. Wash your hands immediately after applying Betamethasone Valerate Foam, 0.12%, and discard any unused dispensed medication. Do not wash or rinse the treated areas immediately after applying Betamethasone Valerate Foam, 0.12%. • Do not use this medication for any condition other than the one for which it was prescribed. • Betamethasone Valerate Foam, 0.12% is for external use only. • Keep the foam away from your eyes, as it will sting. If the foam gets into your eyes, rinse well with cold water. If the stinging continues, contact your doctor immediately. If you forget to apply Betamethasone Valerate Foam, 0.12% at the scheduled time, use it as soon as you remember, and then go back to your regular schedule. If you remember at or about the time of your next daily application, apply that dose and continue with your normal application schedule. If you miss several doses, tell your doctor at your next appointment. As with all medications, there may be some side effects. The most frequent side effects associated with the use of Betamethasone Valerate Foam, 0.12% include mild burning, stinging, or itching at the site of application. These side effects typically disappear shortly after application. • Any unusual effects that you do not understand. • Affected areas that do not seem to be healing after several weeks of using the foam. • The treated areas should not be bandaged or covered unless directed by your doctor. • Keep this and all medicines out of the reach of children. • Store at 20 - 25°C (68 - 77°F) [See USP Controlled Room Temperature] and protect it from direct sunlight, as this is a pressurized container. • Keep away from and do not spray near fire, open flame, or direct heat—this product is flammable. Do not smoke while using or holding the can. Keep the can away from all sources of ignition. Do not pierce or burn the can, and never throw the can in a fire, even if empty. • When you have finished your treatment, dispose of the can safely. A completely empty can is recyclable. • Do not use the foam after the expiration date shown on the bottom of the can. • Do not give Betamethasone Valerate Foam, 0.12% to anyone else. Your doctor has prescribed this medicine for your use only.